In nineteen eleven to Boston he came, a dory man tried and true. Rigged gear for the fleet and cleared our bad snarls, recoiled in a tight perfect lay. With his help all that summer we landed huge trips and a half share we left in his cart. We’d leave him some beer and groceries to hand in the winter when gear work was few. To a hospital bed in Hyannis he went not far from our boat on the bay. Hated that hospital food, he did, wouldn’t eat and was wasting away. Wrapped it in foil and raced to the hospital, still hot when he reached for his fork. So each day we’d cook and bring him his lunch, hear his stories which Denny called lies. The food there was better, but Denny was failing, companionship was all he could share. From their dories through years of weather and waves, saw men lost in the fog evermore. Their memories and laughter of days now long gone when from dories they worked with such pride. I was lucky to know him, see his art working gear, he was small but to us he was great. Four dory men true, gathered together, keeping real their lost way of life. And just as his memories are lost now forever mine soon will fade in the black. Whaler, salt banker, dory man he, now one with the unchanging sea. Raghavan, Maanasa, Matthias Steinrücken, Kelley Harris, Stephan Schiffels, Simon Rasmussen, Michael DeGiorgio, Anders Albrechtsen, …Eske Willerslev. How and when the Americas were populated remains contentious. Using ancient and modern genome-wide data, we find that the ancestors of all present-day Native Americans, including Athabascans and Amerindians, entered the Americas as a single migration wave from Siberia no earlier than 23 thousand years ago (KYA), and after no more than 8,000-year isolation period in Beringia. Following their arrival to the Americas, ancestral Native Americans diversified into two basal genetic branches around 13 KYA, one that is now dispersed across North and South America and the other is restricted to North America. Subsequent gene flow resulted in some Native Americans sharing ancestry with present-day East Asians (including Siberians) and, more distantly, Australo-Melanesians. Putative ‘Paleoamerican’ relict populations, including the historical Mexican Pericúes and South American Fuego-Patagonians, are not directly related to modern Australo-Melanesians as suggested by the Paleoamerican Model. Skoglund, Pontus, Swapan Mallick, Maria C. Bortolini, Niru Channagiri, Tabita Hunemeier, Maria L. Petzl-Erler, Francisco M. Salzano, Nick Patterson, and David Reich. 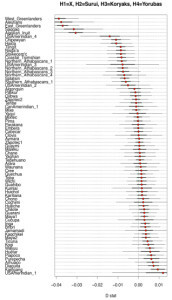 Genetic studies have consistently indicated a single common origin of Native American groups from Central and South America. However, some morphological studies have suggested a more complex picture, whereby the northeast Asian affinities of present-day Native Americans contrast with a distinctive morphology seen in some of the earliest American skeletons, which share traits with present-day Australasians (indigenous groups in Australia, Melanesia, and island Southeast Asia). Here we analyse genome-wide data to show that some Amazonian Native Americans descend partly from a Native American founding population that carried ancestry more closely related to indigenous Australians, New Guineans and Andaman Islanders than to any present-day Eurasians or Native Americans. This signature is not present to the same extent, or at all, in present-day Northern and Central Americans or in a ~12,600-year-old Clovis-associated genome, suggesting a more diverse set of founding populations of the Americas than previously accepted. Whole-genome and ancient DNA studies continue to topple conventional paradigms, befuddle academic researchers and fulfill out-of-America predictions. The two brand new studies by teams from the Reich lab at Harvard and the Willerslev lab at the University of Copenhagen postulate no fewer than three ancestry components in Amerindians related to three major population clusters in the Old World. Just 10 years ago the opinion was split between those scholars who imagined genetic and cultural continuity between Amerindians and East Asians and the peopling of the Americas at 15,000 years ago and those who postulated discontinuity from the ancestors of modern East Asians and the isolation of proto-Amerindians for some 15,000 years in Beringia. The latter model known as the “Beringian Standstill Hypothesis” (Tamm et al. 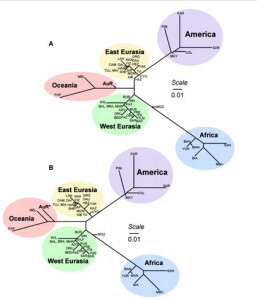 2007) sought to explain the presence of unique genetic signatures in modern Amerindians which required time and geographic isolation from the ancestral East Asian pool to accrue and stabilize. The Yana Rhinoceros Horn site located in close proximity to the East Siberian Sea shore and dated at 30,000 YBP provided the material evidence and the lowest chronological horizon for a proto-Amerindian source population presumably locked in a northern refugium during the LGM times and waiting for the ice shield to melt before spreading into the New World. While the two mental models differed in the extent to which they allowed for discontinuity between East Asians and Amerindians, they both imagined a homogeneous East Asian gene pool yielding an even more homogeneous Amerindian population. With the sequencing of the DNA from the Mal’ta boy located in South Siberia and dated at 24,000 YBP, this thinking proved to be false. The Mal’ta site itself was located thousands of miles south of the mouth of the Yana River. More importantly, its DNA showed affinity to modern Amerindians and West Eurasians to the exclusion of modern East Asians (Raghavan et al. 2014). So, during the LGM times distinct Amerindian ancestry was already detectable in a geographically northeast Asian sample, while East Asian ancestry was not. Contrary to the prediction of both the East Asian Continuity and the Beringian Standstill models, a distinctive Amerindian genetic signature predated a distinctive East Asian genetic signature in the heart of Siberia and its closest affinities were with modern Europeans and not East Asians. 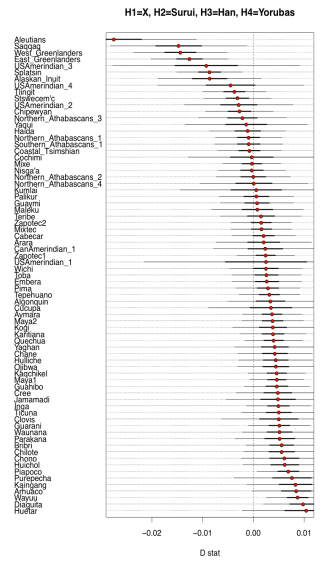 Amerindians turned out to be older, more heterogeneous and less East Asian than everybody thought. The academic community responded to this puzzling finding by postulating an extinct “Ancient Northern European” (ANE) population that admixed with an East Asian population to generate ancestors of modern Amerindians. The ANE signature was later also found west of the Urals in ancient Kostenki DNA at 36,000 YBP (Seguin-Orlando et al. 2014; also covered here) as well as across a wide range of modern European, Middle Eastern and Caucasus populations including the putative Yamnaya ancestors of Indo-European speakers (Haak et al. 2015). But the best living example of that ancient Eurasian population continue to be Amerindians. 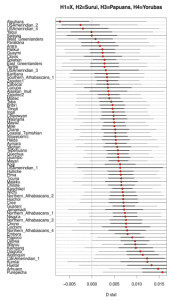 The genetic impact of ANE on West Eurasians is so significant that all of the ancient samples discovered in Europe, from La Brana foragers to Stuttgart farmers, as well as all of the modern European populations score closer to modern Amerindians than to modern East Asians or Australo-Melanesians. Up until now, Australo-Melanesians have never been a factor in the population genetic theories of the peopling of the Americas. Whether imagined as the earliest and sovereign wave of modern humans emanating from Africa along a “southern” migratory route or an early offshoot of an East Asian population, Australo-Melanesians have always been considered too old in terms of their divergence time and too southern in their geographic distribution to play a role in the peopling of the Americas via the Bering Strait bridge. Linguists, ethnologists, folklorists and ethnomusicologists, on the other hand, have long pointed out suggestive parallels between grammatical traits, mythological motifs, rituals and musical styles and instruments between some New World regions (especially, Amazonia but also North America) and the Sahul (see more here). Two examples from their Fig. S10 can be seen below. What it shows is that some Amerindian populations markedly shift in the direction of Papuans or Aeta compared to the majority of Amerindians. Importantly, this shift affects some of the same populations (e.g., Aleutians and Saqqaq) that also shift toward Han and Koryaks but, remarkably, the Australo-Melanesian pull is stronger than the East Asian pull! (see below from Fig. S10 in Raghavan et al. 2015, where negative D values are lower when Han and Koryaks are compared to Amerindians than when Papuans and Aeta are compared to them). Importantly, the Australo-Melanesian shift is displayed by populations from both South America and North America, so it’s a low-frequency but pan-American phenomenon. Raghavan et al. 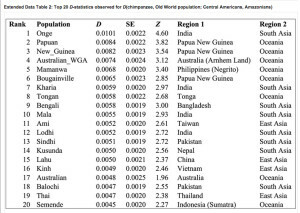 (2013) showed that some North American populations are more East Asian shifted and less ANE-shifted than Central and South American populations. Now, they present evidence that those populations are more Australo-Melanesian-shifted than East Asian-shifted. 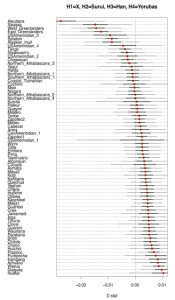 Extended Data Table 2 in Skoglund et al. 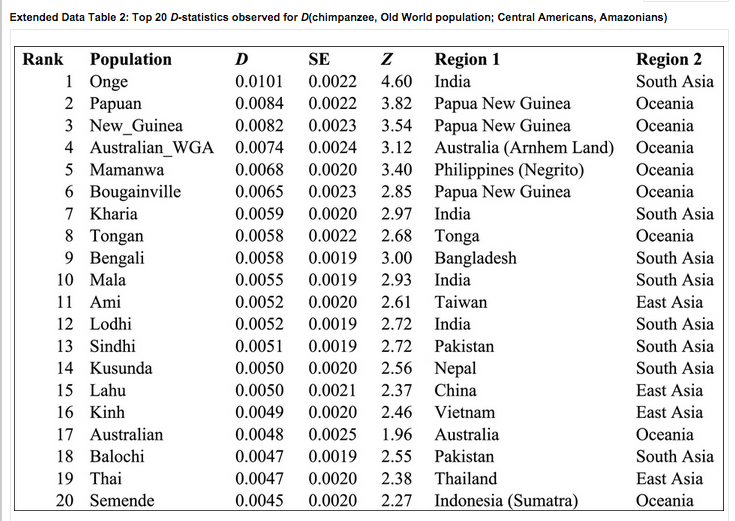 (2015) (see below) shows this excess of Australo-Melanesian alleles (Z values positive) in Amazonians (Surui, Karitiana and Xavante) compared to Central American Indians (as proxies for other Amerindians including the 12,000-year-old Anzick sample from Montana). Interestingly, the “Australo-Melanesian” footprint in the Old World is geographically broad spanning South Asia, Southeast Asia as well as the Sahul. It’s clearly the pre-Mongoloid and pre-Austronesian “substrate” in the eastern provinces of the Old World. Skoglund et al. (2015) seem to be more reasonable in their judgment. 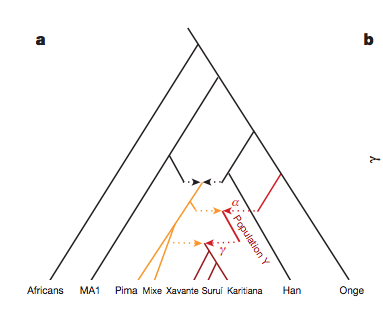 Their phylogenetic tree with admixture arrows (see on the left) captures well the ever-more-complex prehistory of the New World. It used to be that Amerindians were depicted as a simple offshoot of a Han-like population (see the tree on the right, from McEvoy et al. 2010, Fig. 1). The branch connecting them to East Asians has always been long but it was interpreted as the effect of a bottleneck induced by the Beringian Standstill and subsequent further isolation in a newly-colonized continent. Now, Amerindian ancestry, whether northern or southern, spans the whole gamut of extra-African genetic diversity. In addition, the Australo-Melanesian link in the New World is clearly connected to the discovery of a stronger Denisovan signal in Amerindians vs. East Asians (Qin & Stoneking 2015), which suggests that Amerindians must be older than the LGM time frame entertained by Raghavan et al. (2015). While Raghavan et al. (2015) dismiss the Australo-Melanesian hypothesis advanced by craniologists, Skoglund et al. hope that direct DNA analysis of the Paleoindian material from Amazonia will yield support to their finding. Importantly, just like the mythical “Ancient Northern Eurasian” (ANE) population to which the Mal’ta boy belonged is claimed to no longer exist in the Old World, the ancient Population Y ceased to exist, too. But apparently their descendants are well and alive in the New World. Out-of-America can end the torturous guesswork that the population genetic community is engaged in trying to explain the high allelic diversity and the diverse set of continental connections to the Old World exhibited by Amerindian genomes. 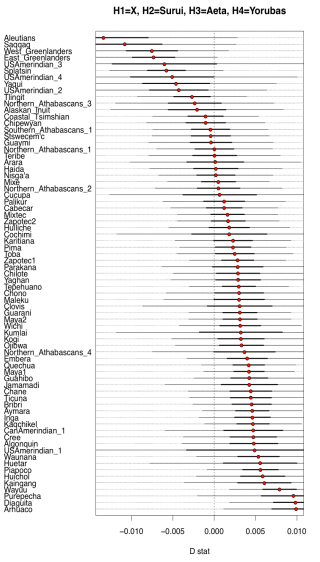 Phenomenal linguistic and cultural diversity in the Americas (with its well-documented connections to West Eurasia, East Asia and the Sahul) now receives full corroboration from population genetics. One pulse from a single, structured ancient Amerindian population followed by long-range migrations to the Sahul, Middle East/Caucasus, Europe and East Asia around 60-40,000 YBP provides an elegant explanation to the observed cross-disciplinary pattern. Southeast Asia and Australia give archaeologists some of the best evidence for ancient sea crossings, not just by Palaeolithic humans but also by Neolithic peoples and even spice traders contemporary with the Roman Empire. New discoveries, some controversial, are pushing back the dates of human colonization of this region and are expanding our knowledge of early island networks. These finds are also illuminating the first steps in some of the longest prehistoric open-sea voyages of colonization on record–from Southeast Asia to Polynesian islands such as Hawaii, Easter Island, and New Zealand, and perhaps also from Indonesia to Madagascar–during the first millennium A.D.
To understand the implications of these discoveries, one must be aware that the Indo-Malaysian Archipelago contains two very different biogeographical regions. The western islands on the Sunda Shelf–Sumatra, Java, Bali, and Borneo–were joined to each other and to the Asian mainland by landbridges during glacial periods of low sea level. Hence they supported rich Asian placental mammal faunas and were colonized by Homo erectus, perhaps as early as 1.8 million years ago. The eastern islands–Sulawesi, Lombok, Flores, Timor, the Moluccas, and the Philippines–have never been linked by landbridges to either the Sunda Shelf or Australia, or to each other. They had limited mammal faunas, chance arrivals from Asia and Australasia. Migration through the archipelago has always required that humans cross substantial stretches of open sea. But when did they first attempt to do this? There is a current controversial claim by a joint Dutch-Indonesian team that humans were contemporaries of stegodons, extinct elephant-like animals, at a site called Mata Menge on the Indonesian island of Flores. Stone flakes and stegodon bones have been found here in presumed association in deposits located just above a reversal of the earth’s magnetic field dating to 730,000 years ago. Should this claim receive future support we will have to allow for the possibility that even Homo erectus was able to cross open sea, in this case the 15-mile-wide Strait of Lombok between Bali and Lombok. That the Australian continent was first settled at least 30,000 years ago, by people who had to cross consecutive sea lanes in eastern Indonesia, was well known by the late 1960s. Research by the late Joseph Birdsell and by Geoffrey Irwin of Auckland University suggests that there were separate northern and southern routes, along which most islands would have been visible from their closest neighbors on clear days, leading from the Sunda Shelf islands towards Australia and New Guinea. If Australia was first reached from Timor, as seems likely, then a final sea crossing of about 55 miles, involving movement out of sight of land, would also have been required. The Australian archaeological record has now been pushed back to the limits of conventional radiocarbon dating, with several sites clocking in between 35,000 and 40,000 years ago. Radiocarbon dates of this age are potentially subject to contamination by younger carbon at levels undetectable in the laboratory. Such contamination can produce a date younger than 40,000 years when the real age is much older. In recent years, optical luminescence dating of sites in northern Australia has raised the possibility that humans arrived there as long as 60,000 years ago, and many archaeologists now accept these new dates. More controversial are current reports, widely publicized in the world media and published in the journal Antiquity, that Jinmium, a sandstone rock-shelter in Australia’s Northern Territory, has stone artifacts more than 100,000 years old. The site’s investigators–Richard Fullagar of the Australian Museum in Sydney and Lesley Head and David Price of the School of Geosciences at the University of Wollongong–used thermoluminescence dating to determine the age of its lower levels. The lowermost stone artifacts are claimed to be more than 116,000 years old. Because the Jinmium dates are from thermoluminescence rather than the more accurate single-grain optical luminescence, many archaeologists question this claim, and verification is essential. Conventional wisdom has always held that the first humans to reach Australia were modern Homo sapiens, but if the Jinmium dates are correct it could be that more archaic forms once lived in Australia, as they did throughout the rest of the tropical and temperate Old World. Indeed, on Java new dates from the Ngandong and Sambungmacan sites suggest that Homo erectus may have survived far longer than previously believed, perhaps to as recently as 25,000 years ago (see “Homo erectus Survival“). Elsewhere in the Southeast Asian island region, new evidence for early voyaging comes from archaeological projects undertaken in the Moluccas, northern Borneo, and Bali. In the northern Moluccas, between Sulawesi and New Guinea, humans were visiting the coastal caves of Golo and Wetef on Gebe Island 33,000 radiocarbon years ago. Caves and open sites on coastal Sulawesi, northern coastal New Guinea, the Bismarck Archipelago, and the northern Solomons (southeast of New Guinea) have already produced similar dates. At this time people seem to have been very mobile, leaving only sparse traces of occupation (mainly flaked stone tools and marine shells) and not engaging much in trade of raw materials, such as stone for making tools. Many of the islands at this time, especially in the Moluccas and island Melanesia (the Solomons, Vanuatu, and New Caledonia), may have had such limited land faunas that they were unable to support large permanent populations. Those who reached New Guinea and Australia, then joined by a landbridge, might have found a better living hunting now extinct species of large marsupials and flightless birds. Current research at the site of Cuddie Springs near Brewarrina in western New South Wales is demonstrating contemporaneity of humans and megafauna on the Australian continent about 30,000 years ago. Between 20,000 and 10,000 years ago the Moluccan and island Melanesian archaeological records indicate greater contact and innovation. Obsidian from New Britain was carried to New Ireland (but not apparently as far as the Moluccas) possibly beginning 20,000 to 15,000 years ago. Marsupials were deliberately taken by humans from New Guinea and perhaps Halmahera to stock small islands, presumably for hunting purposes. Cuscuses (nocturnal catlike creatures) were taken to New Ireland, and by 10,000 years ago both cuscuses and wallabies appeared on Gebe. The people of Gebe also built small circular arrangements of coral blocks, too small to have functioned as hut foundations, on the floor of Golo Cave ca. 12,000 years ago. They may have served a ritual function. Several sites in the northern Moluccas, Talaud, and Admiralty Islands have a unique and rather impressive industry of adzes made from shells of large Tridacna and Hippopus clams at about the same date. These adzes suggest that manufacture of dugout canoes was technically possible by 13,000 years ago, although the earliest colonists of these islands probably paddled small rafts. Whatever their craft, the extent and repetitiveness of the earliest colonizations–to as far east as the Solomon Islands via many island-hops by 30,000 years ago–makes some degree of intentionality undeniable. Many millennia later the Indo-Malaysian region again witnessed remarkable transfers of people and material culture. Three thousand years ago, Neolithic people exchanged New Britain obsidian across 2,400 miles to the site of Bukit Tengkorak in Sabah, northern Borneo. The Lapita people moved it for 2,100 miles eastward from New Britain to as far as Fiji. A new report in the journal Science claims that New Britain obsidian, excavated by archaeologist Stephen Chia of Universiti Sains Malaysia and analyzed by anthropologist Robert Tykot of the University of South Florida, reached Bukit Tengkorak much earlier, by 4000 B.C. No details of the dating are presented, however, and the claim remains unsubstantiated. During the original excavation of this site, by myself in 1987, we recovered a good series of radiocarbon dates and obsidian, identified by Roger Bird of the Australian Nuclear Sciences and Technology Organisation as coming from New Britain. At that time we concluded that the Bukit Tengkorak obsidian dated back no further than 1000 B.C. and was contemporary with the Lapita archaeological culture of the western Pacific (ca. 1500 to 300 B.C.). As far as Lapita is concerned, my own view, and that of many other archaeologists including Patrick Kirch of the University of California at Berkeley, is that the Lapita culture represents the Austronesian-speaking Neolithic populations that colonized Oceania (Melanesia, Micronesia, and Polynesia) beginning ca. 1500 B.C. These people were ancestral to modern Polynesians and eastern Micronesians, and also ancestral, to a lesser degree because of the prior existence of human populations in the western Pacific, to many of the populations of island Melanesia. In this view, Lapita represents a transmission of people, and Austronesian languages and cultures, into Oceania from Island Southeast Asia, and ultimately from southern China and Taiwan. It is significant that the New Britain obsidian trade, although occurring locally back into the Pleistocene in the Bismarck Archipelago, reached its long-distance apogee in Lapita times. Opposition to this view of Lapita origins comes from John Terrell of the Field Museum of Natural History, who believes he has found evidence that many cultural features linked with Lapita may have evolved on the northern coast of Papua New Guinea and not in Southeast Asia. At sites near the town of Aitape he has found pottery, so far not precisely dated, which resembles Lapita but lacks its elaborate impressed designs. According to Terrell it also resembles pottery made in Indonesia at about the same time as Lapita, and perhaps even slightly before. Terrell believes that the Polynesian ancestors did not migrate directly from Southeast Asia but were living in northern New Guinea for a very long time before some people finally left Melanesia to colonize Polynesia. However, archaeologists such as myself, who have undertaken research in both Island Southeast Asia and Polynesia, may find this opinion difficult to accept and will certainly demand accurate dating of the new materials from Aitape before giving them serious attention. We also have dramatic new evidence of sailing ability in the early historical period in Southeast Asia, in this case perhaps involving use of the monsoon winds that blow seasonally across the Bay of Bengal. About 2,000 years ago, pottery characteristic of the Indo-Roman site of Arikamedu in Tamil Nadu, on the Indian coast, found its way to the site of Sembiran in Bali (excavated by I.W. Ardika of Udayana University in Bali), an astounding 2,700 miles as the crow flies, or much more if the sailors hugged the coast. This Indian trade pottery–the largest assemblage ever found outside the Indian subcontinent itself–heralded a millennium of cultural contact that gave rise to the temples and civilizations of Pagan, Angkor, and Borobudur. Much of this trade probably involved spices–even Romans occasionally acquired cloves, which came from small islands in the northern Moluccas. Future research, if some of the above claims are to attain the status of fact, must involve more thorough dating and more careful attention to the stratigraphic pitfalls that one can fall into, both in caves and open sites. 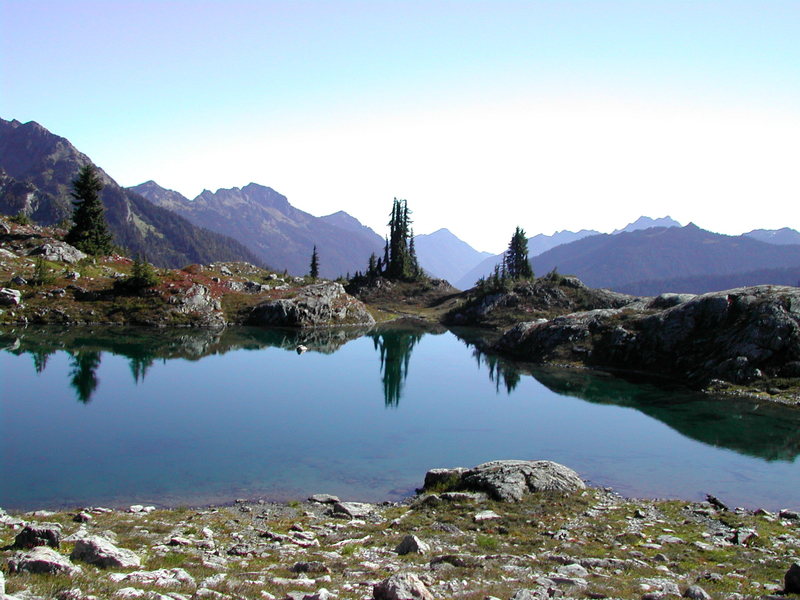 Apparent associations between artifacts, datable materials, and geomorphological contexts can often be deceptive. Furthermore, all the coastal sites that might contain direct traces of Pleistocene colonization were inundated by a rise in the sea level of 325 feet or more after the last glacial maximum. All we see now is the inland geographical skeleton of the former landscape. Underwater archaeology might one day come to the rescue, but so far historical wrecks are proving more attractive, and lucrative, than sunken Pleistocene sites. Peter Bellwood is a professor in the department of archaeology and anthropology, Australian National University. His research in the Moluccas was supported by grants from the National Geographic Society and the Australian Research Council. A revised edition of his Prehistory of the Indo-Malaysian Archipelago will be published by the University of Hawai’i Press this year. Check out this link – clear and compelling evidence that much, if not all, evidence of ancient human activity in North America may lie beneath the sea….This is Daryl Fedje discussing his excellent work near Haida Gwaii, the former Queen Charlotte Islands off the British Columbia Coast, and the site of two of my tales.